They say every dog has it's day, but if you have been bitten by a canine, you can have your day too with the help of a dog-bite attorney. There are over 83 million dogs in the United States, and about 57 million dog owners. Losses associated with dog bites exceed $1 billion annually. Every year, there are between 30 and 35 dog attacks that result in a fatality, and about 850,000 dog bite victims seek some form of medical attention every year, over 350,000 of which are seen in an emergency room—that amounts to over a thousand per day. There are almost 4 million other dog bite victims every year who do not seek medical attention. Although any breed of dog can attack, in years when data was collected (1997–98), pit-bulls and Rottweilers together accounted for two-thirds of human dog-bite related fatalities. However, in spite of the huge number of dog attacks, only about three out of every thousand victims are compensated for their losses by homeowners or renters insurance. Nevada, unlike many other states, does not have a specific dog-bite statute. Rather, dog-bite cases are premised in negligence, the same as auto-accident and slip-and-fall cases. Dog owners are negligent when they breach a duty of care (or violate a code, statute, or ordinance designed to protect people from dog bites), and that breach causes injury or damage to another. In dog-bite cases, the breach of duty often takes the shape of dog owners allowing their dog to be in a situation where the safety of others is at risk despite knowing that the dog has dangerous propensities. Although a dog bite victim is not required to prove that the dog had bitten on a prior occasion, evidence of a prior attack would typically be enough to show that the owner had knowledge of the dog’s dangerous propensities. If you have been bitten by a dog, don’t be one of the over 99% of dog-bite victims who never receive compensation for their injuries. 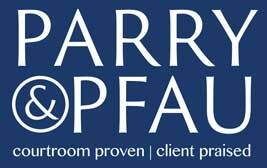 Contact the attorneys at Parry & Pfau for a free confidential consultation.